CLARION CO., Pa. (EYT) – The winds of change have been gusting in the tattoo industry over the last few decades, and the changes have affected the local industry, as well as those across the country. The invention of the first electric rotary tattoo machine, inspired by Thomas Edison’s electric pen, made way for Martin Hildebrandt to open a tattoo parlor in New York City in the late 1800’s, according to Time magazine. Nevertheless, the early artform was fraught with negative associations. In the early parts of the twentieth century, tattoos were something found on the fringes of society, sported by sailors, sideshow performers, and later, bikers and gang members. Early tattoos were often created by traveling artists in caravans, while larger cities had small back-alley shops, often derided for their lack of cleanliness. However, the latter part of the twentieth century brought massive change to the industry, as many popular musicians began to sport colorful artwork on their skin by the 60s and 70s, beginning a slow turn of the tide of associations for the art form. ExploreClarion.com spoke to a number of local industry insiders about their own experiences with the tattoo industry and how it has continued to change. Glenn Beers told exploreClarion.com that the old stigma was originally well-deserved. “It used to be you hung out in a shop, and there was a bleach bucket that was changed once a week and you wiped everything down with it and that was that,” Beers said. Beers noted that he still gets expressions of surprise about their fanatical devotion to cleanliness, safety, and proper aftercare, particularly from older clients who come in. 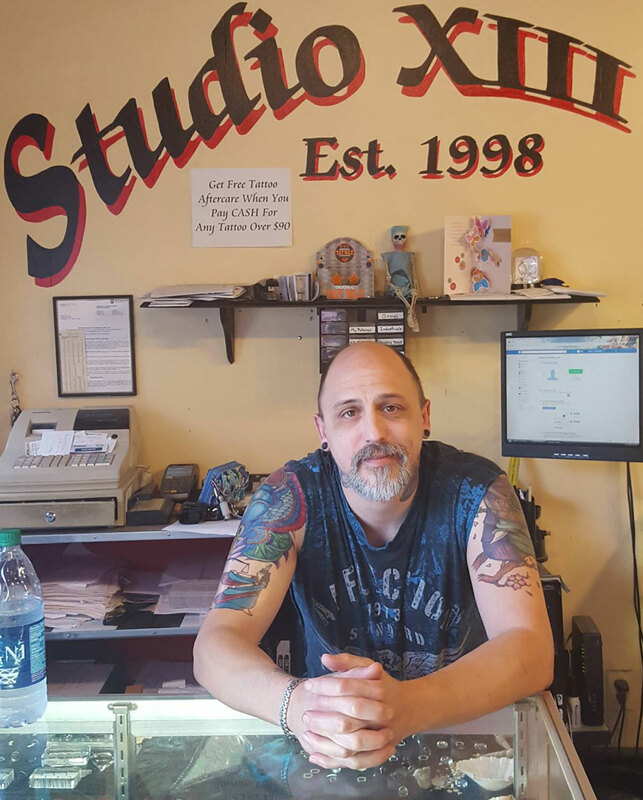 Beers has been running Studio XIII for twenty-one years, making it the longest established tattoo and piercing business in the area. He noted that the industry has gone through a number of changes recently, as well. Clarion has seen its share of shops come and go, with a number of shops opening in the area in the last decade, then moving on. Andy Mast was a proprietor of a Resolute Tattoo, a former Clarion area business, which just closed earlier this year. 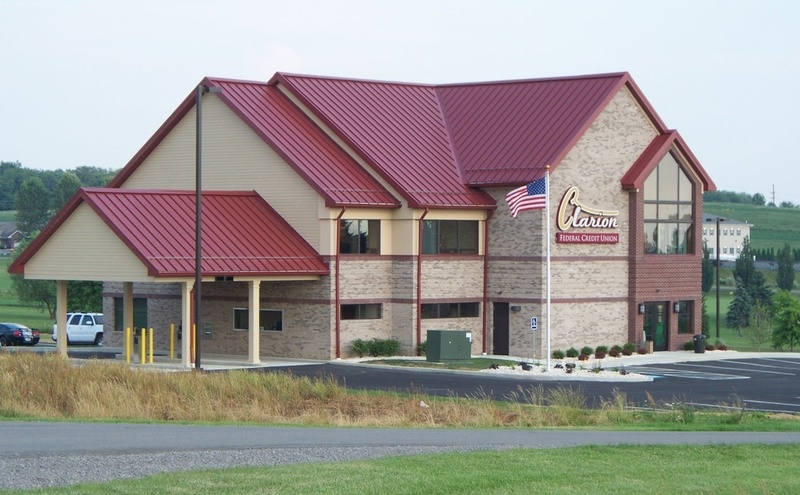 “As a business owner, it’s difficult pulling skilled and trustworthy employees into a smaller town like Clarion,” Mast said. In July of this year, Mast closed his Clarion business and began working out of Ink Excess Tattoo Studio in DuBois. 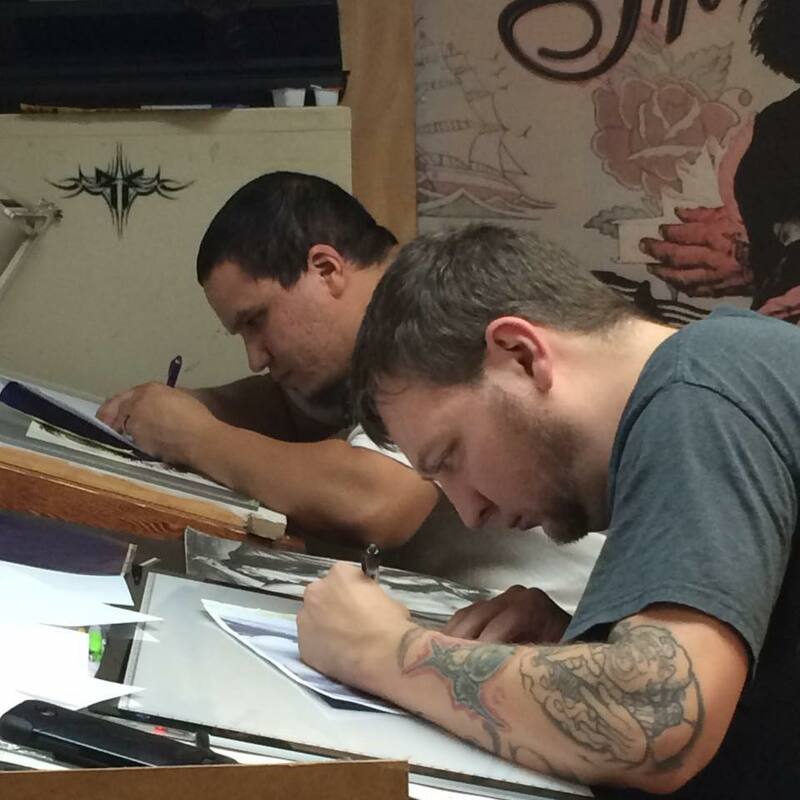 Mast, who began his own training locally, under an artist in the Franklin area, finished his apprenticeship under world-renowned artist Marc Fairchild, who owned one of the largest chain of tattoo shops on the east coast. He also discovered a distinct difference in the reaction many people had to visible tattoos in more developed areas as opposed to the rural areas. Mast also noted that the industry has changed immensely by the popularization of tattoos in the media over the intervening years. Morgan Roos, an Oil City native who tattooed at the recently closed Bad JuJu Tattoo in Seneca, expressed very similar sentiments about the advances in the equipment and cleaning techniques in the industry. “A lot of people from my church had that stigma about tattoo shops: they’re dirty or whatever, but when I started working there, they came into the shop and realized ‘Oh, this can be done the right way,'” Roos said. Another strong proponent for professional tattoo parlors is the importance of cleanliness; Roos emphasized concern about how those who offer tattoos from their homes are negatively affecting the industry. Roos believes that when it comes to getting a permanent work of art on your body, taking the time to find the right artist in the right setting is incredibly important. She also noted, with the profusion of tattoo artists and business in some areas, it is best to ask about their methods for handling tools, as well. 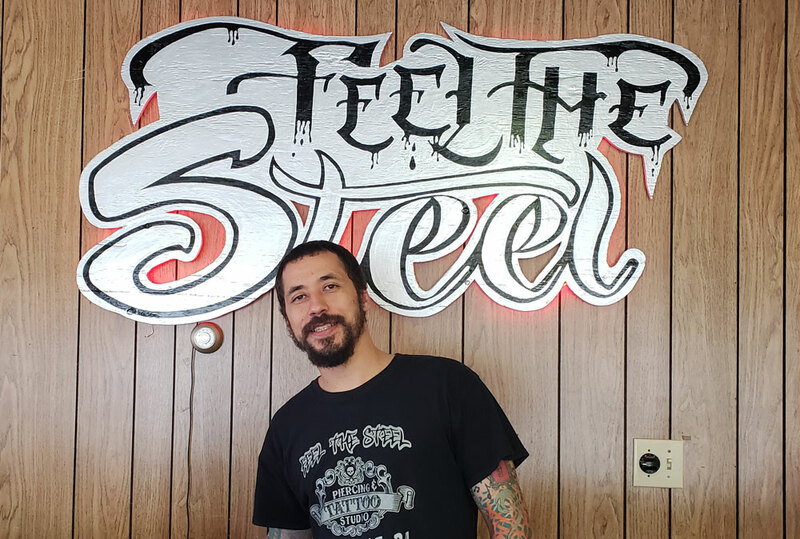 Corey Anderson, the proprietor of Feel the Steel Tattoo and Piercing, also emphasized the importance of cleanliness in contemporary tattoo shops. “You should always stress to people you have to get it in an environment like a doctor’s office atmosphere, and there’s no reason not to,” Anderson said. Anderson, who did a lot of traveling and doing guest spots at tattoo shops from Canada to Florida before settling down to open his business in Brookville, noted many of the same changes in the industry as Beers noted. Anderson shared the story of two very memorable customers he tattooed, which all began with a call from a woman from California who was in the area to visit her elderly and ailing grandmother. According to Anderson, the woman brought her grandmother – in a wheelchair with her oxygen tank in tow – to the business because they wanted to get tattoos together. Anderson noted that there have been many instances of people he has tattooed that he felt had an experience that went beyond just the artwork. Ric Austin and Nex Arroyo both noted similar experiences where the customers’ tattoos tell a story. “We get so many personal tattoos in here, people who have lost loved ones, people who have lost pets, that’s another big one, we do a lot for people who have lost their companions, and sometimes that can end with an emotional response at the end of the tattoo,” Austin said. “Whatever you’re going to put on you is most likely something you truly believe in or something that you really like or are into. Sometimes people just seeing that on someone else brings people together and that’s what we want to do, to bring the community together,” Arroyo added. While the negativity and stereotypes surrounding tattoos have faded somewhat over the years, many of the industry insiders noted that they are certainly not completely gone. John Tucker, who began his tattooing career as an apprentice at Resolute Tattoo in Clarion and is currently an artist at Ikonic Tattoo Co. in Tampa, Florida, noted that while he doesn’t see a lot of negativity, he has gotten a few minor instances of someone asking why, shaking their head at him, or looks of disgust, mainly from people of older generations. “People down here in Tampa are a lot more open and into it. I think it’s just because being a bigger city, warm year round, and a younger age demographic for the city help make it less negative. 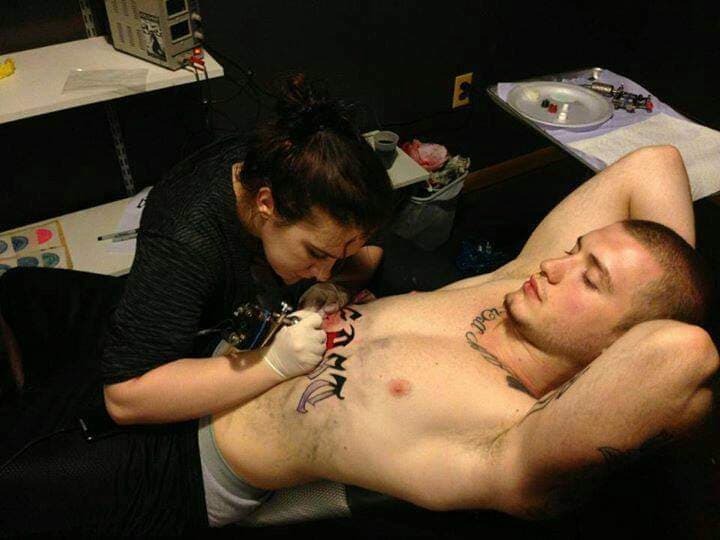 Jobs don’t seem to mind about tattoos at all down here,” Tucker said. Tucker also noted that not all tattoos are created equal, and sometimes the content or symbolism of a tattoo is more of a problem than the mere existence of the tattoo. The refusal to tattoo certain things, or even tattoo certain parts of the body, was another topic that was echoed among many of the individuals interviewed. “I usually turn people down if it’s anything that will offend other people, including myself. If someone comes in here and has something that they want to put on themselves, usually they explain to me the reason why, but I’m the one that’s doing the work, so if I think it’s not appropriate, in my own beliefs, I will not tattoo it on them. I will politely decline the tattoo,” Arroyo said. Beers also said that he refuses any requests for hate symbols at his business, while Anderson noted he has denied customers based on the symbols they have requested and tried to get them to change their choices. Anderson explains that some people may not know what they are getting into with certain types of tattoos. That attitude toward their customers, not only caring that they get the artwork they want but also caring about how it may affect their lives, was also echoed repeatedly throughout many of the interviews. Austin said that he doesn’t do face tattoos, as he wants the customers to realize how it may affect their lives. “We won’t do face tattoos, and I won’t do neck tattoos unless it’s on someone who’s heavily tattooed already. A lot of artists won’t do hand tattoos or finger tattoos; we still do, but we’re very cautious. 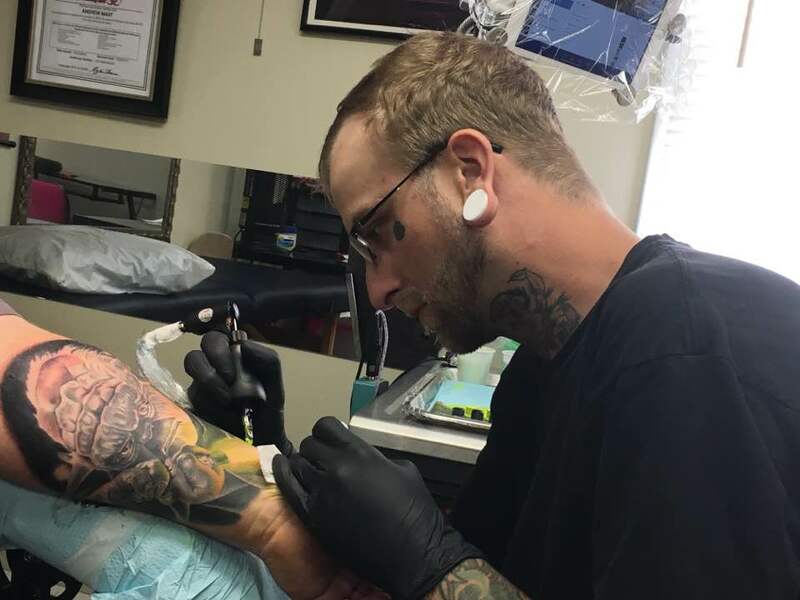 When you get into tattoos that are in areas that are very highly visible like that we try to sit down with the customer and talk to them and, even if it means money out of our pockets, we want to help them make the best decision that they can,” Austin noted. Likewise, Beers noted that they do not do facial tattoos or hand tattoos and Studio XIII, and Anderson said much the same for Feel the Steel. Mast explained that he doesn’t tattoo minors. “I don’t tattoo minors period, even with a parent’s signature, anything racist or drug-related, or pretty much if I think someone is flat out making a bad decision,” Mast noted. Some of the changes in the industry have also gone beyond just the popularity and the cleanliness, with major changes in the artwork itself over the last few decades. “If you look at thirty years ago and go back and look at the tattoo magazines of what was essentially the best work being put out thirty, forty, fifty years ago, and then you look at the work that’s being put out today, I mean, you’ve got amazing artists all over the place,” Austin said. While the artwork is obviously central to the industry, the focus on the customer, what they want, and what they can afford, is also a concern in the area. Roos noted that shops in this area have to keep their clientele in mind when setting prices because people in this region just can’t afford the kind of prices that some more urban shops set. “A lot of the time you know what your art is worth, but you have to look at your clientele and consider what they are able to afford. That’s just something that you have to compromise on for this area,” she said. Beers made note of the same issue, saying that they try to keep their prices in a reasonable range to make both tattoos and piercings affordable for locals. “We’re not going to get rich, but this isn’t what you do if you want to get rich. That’s not Clarion, and that’s not us. We’re just like everyone else, paycheck to paycheck, day to day, but we do what we like,” he noted. While urban areas can offer higher standard prices, and therefore a higher pay rate, for those in the industry, according to Anderson, it also offers far more competition and rivalries between businesses, and a fast-paced environment with more stresses than some artists want to deal with. “What mainly started this in Brookville was that I felt my peace and serenity out here. I love it out here. Jefferson County is a beautiful place,” Anderson said. Ric Austin, who grew up in Venango County, loves his community as well and chooses to reach out through Austin Ink’s charity efforts, which range from simple donations to Chinese Auctions, to their hosting their own events for locals in need. “I think that when we do something like that [charity event], not only are we helping people, but we’re setting an example for the community,” Austin noted. That sentiment, that reminder that whether an individual chooses to adorn themselves with tattoos, or to leave their skin unmarked, was echoed many times throughout the interviews. “I think the main thing is that no matter if you have tattoos or not, everyone should look and treat each other with respect,” Tucker said.